A couple of years ago, I wrote a blog post about Reddit for this very site. Before it published, I was sure it was going to be my Best Post Ever. I cleared my morning to handle the massive influx of comments. Netting just over 400 shares, it was – by CMI’s standards – a dud. I’ve since learned that confessing my undying love of Reddit to non-redditors creeps people out. Reddit has a strange and even repellant interface, though its engineers are working on a friendlier site redesign now. And when Reddit makes the news, it’s usually a story about the site’s trolls or less attractive underbelly (such as when redditors harassed innocent bystanders after the Boston Marathon bombing, implying they might be the bomber based on appearance alone). If you’re not currently using Reddit, I’m going to try to convince you to change your ways. But before I do, here’s a Reddit 101 for those of you not familiar with the site. Reddit is a collection of thousands of subreddits, communities built around a particular topic or idea. Some subreddits (called “subs”) are massive in size and scope (r/technology), while others can be pretty arcane (r/overlanding). If you have a hobby, there’s a subreddit for that. If you have a problem, there’s a subreddit to help you cope. And there are thousands of subreddits devoted to things you didn’t know you wanted to know about (but do! ), such as r/accidentalrenaissance or r/AnimalsBeingJerks. Each subreddit has its own rules, moderators, and vibe based on the people who subscribe to it. If you visit the site when you’re not signed in to a Reddit account, your “front page” will be a collection of popular posts from across the site – and that’s what usually turns new visitors off. As a little experiment, I took a peek at the top few posts on “popular” to see what a non-user would encounter when visiting Reddit for the first time (timestamp: 3:20 pm on 4/24/18). Let’s just say the editors of this blog would not allow me to post what I saw. To understand why Reddit is awesome, you need to open an account. Without one, your view will default to what is interesting to the average user (my guess: a 20-year-old guy, living at home, eating Hot Pockets). Once you have an account, you can choose subs to join and customize what you see on your front page. That means fewer pictures from r/aww and r/BikiniBottomTwitter, and more posts from the communities you enjoy. Whenever I hear people say, “I don’t get it,” it’s because they haven’t joined subs that interest them. We’ve gathered here, however, not to talk about Reddit in general but to explain Reddit for marketing. I find it fascinating that most content marketers don’t understand just how popular Reddit really is. The numbers speak for themselves. A list of the top websites in the world, compiled by Alexa, shows Reddit comes in sixth, just behind Wikipedia. (Alexa’s rank is calculated using a combination of average daily visitors and pageviews over the trailing 3 months.) Even more amazing? Reddit’s average for daily time on site is more than 15 minutes, crushing the sites above it in the rankings, including Facebook and YouTube. In the last 30 days, Reddit had nearly 60 million unique visitors from the U.S. alone, more than 1 billion visits, and over 8 billion pageviews. Holy cr@p; that’s a lot. 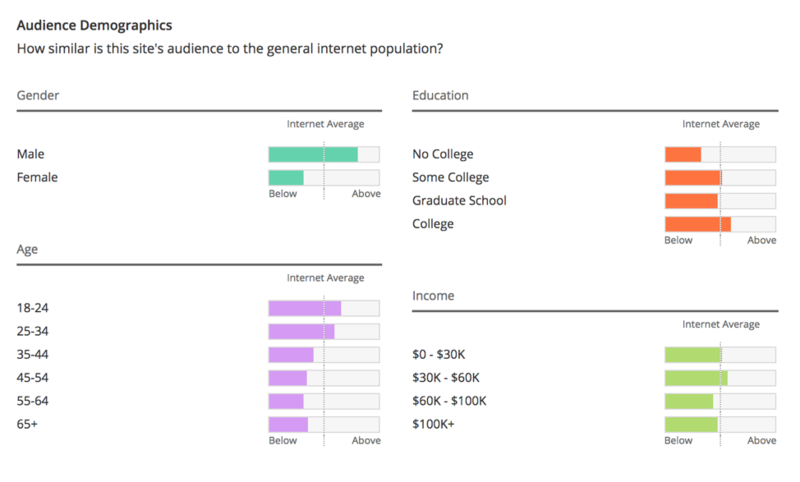 If Reddit’s audience is so massive and engaged, why don’t we hear marketers talking about it? 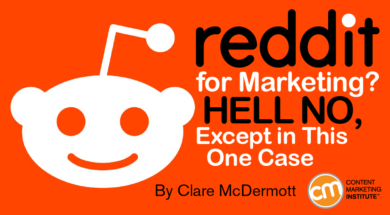 So far, it’s been exceedingly hard for marketers to make any inroads on Reddit – and that’s good. Reddit has tried recently to push marketers into sponsored content, though I’m not convinced that’s working out well either. Therein lies the big problem: On a site where all users are anonymized (which tends to embolden snarky behavior) and where there’s a general disdain for marketing, what’s the role for marketers? The answer: Research, young grasshopper. Reddit is a veritable gold mine of information relevant to your area of expertise, your audience, and your business. The number of subreddits on Reddit is so vast, it’s impossible NOT to find a community that matches your audience and its interests. Are your buyers statisticians? Hang out on r/AskStatistics, r/badstats, r/dataisbeautiful, and r/samplesize. Do you need to attract young programmers to your company? Why not join r/learnprogramming, r/programming and r/machinelearning? Interested in launching a new recipe microsite (poor timing .. but OK!)? 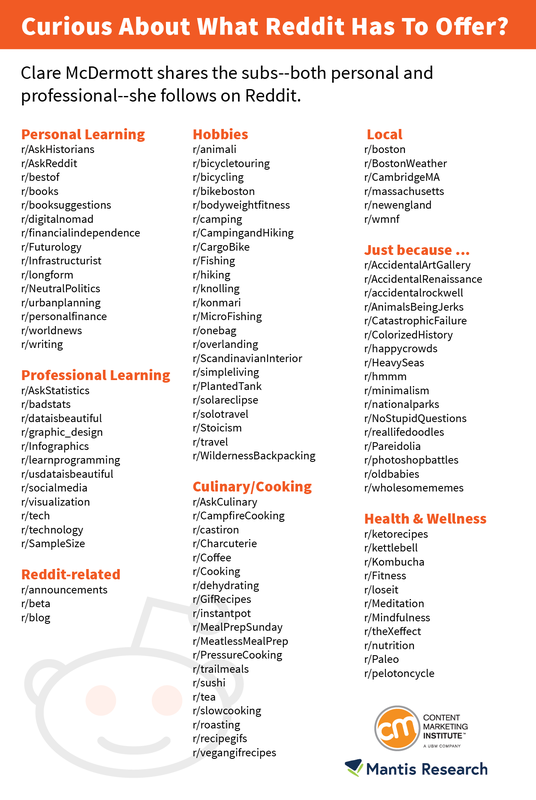 Check out the most popular content on r/GifRecipes. No matter what community you join, you can sort posts in a dozen ways to find the information you need. The best way to check and see if a sub is right for you is to sort by “Top – All Time.” You’ll quickly see what the community is all about. If you’re visiting a sub because it’s interesting from a marketing perspective rather than from a personal perspective, it’s best to keep your mouth shut. Listen without speaking (or typing). If I still haven’t convinced you to road-test Reddit, consider this: When you join a community, there’s often a subtext or inside joke that you only understand after logging some time there. And much of my insider knowledge bleeds out into the real world ­– whether it’s understanding the subtext of my kids’ conversations or getting the joke in Twitter conversations. It’s as if Reddit is a middle-aged mom code-breaking tool to help me understand my older kids. Just the other day I told my 18-year-old son to be careful driving that night because … you know… 420. His eyes widened into white orbs of surprise. My response? Here’s a code you won’t have to break: Use BLOG100 to save $100 when you register for Content Marketing World, which takes place Sept. 4-7 in Cleveland, Ohio. But hurry: Early Bird rates expire May 31.